The winter season is here. So are the allergies! When this season comes, most people look allergic to the entire world. But for others the situation is far more complex. For them the symptoms are not seasonal but persist throughout the year as they show allergies to things like dust, mites, smoke etc. Doing day to day activities with a running nose and watery eyes is not so easy, right? The persistent nose discharge and sneezing complicates things further. The symptoms usually go away sooner or later but most want to get rid of them as soon as possible. One thing that can help you minimize the symptoms are anti-allergy medicines. These medicines have pros and cons of their own but they are effective, without any doubt. So here is a comparison of some of the most commonly used anti-allergic medicines, their mechanism of action, dose, side effects etc. It is a third generation antihistamine drug whose effects are limited to outside the brain and spinal cord. Most people complain of excessive sleep after eating antihistamines and rightly so. If you’ve to be somewhere then eating such antihistamines is definitely not a good choice. Allegra, on the other hand, has got an upper hand as its effects are only limited to the peripheral parts of the body and it induces minimum effects on the brain. That’s why you don’t feel drowsy after eating this medicine. The chemical composition of Allegra can be determined by IUPAC given systematic name to its clinical preparation Fexofenadine. The IUPAC given name is (±)-4- [1 Hydroxy- 4- [4 – (hydroxydiphenylmethyl)- 1- piperidinyl]- butyl]- α, α- dimethyl benzeneacetic acid. This drug is not used for the purpose of cure instead the main function of it is to prevent from effects of Rhinitis and Urticaria. Allegra helps reduce following symptoms associated with seasonal allergic rhinitis and chronic utricaria. Allegra has been deemed safe andeffective for use in adults and children. Children from 2 to 11 years age can used this drug for utricaria and season allergic rhinitis without significant side effects, provided the dose is within recommended range. The normal dosage recommended for Allegra tablets is 60mg or 180mg twice a day with water. Patients already suffering from renal impairment are recommended to use 60 mg tablet once a day. Tablets are to be use only within the recommended dosage and should be taken only with a full glass of water. Allegra ODT is normally prescribed to children of 6 to 11 years age. The normal dosage is 30 mg once in a day and the children suffering for renal impairment are recommended a dose of 30 mg once a day. Allegra ODT is only to be taken on an empty stomach and not to be chewed. Keep the tablet in the blister pack before usage. Use dry hands to place tablet in your mouth and allow it to dissolve instead of quickly swallowing or chewing. To swallow dissolved tablet drink water if you feel like it. The normal recommended dosage of allegra oral suspension for children of age 2 to 11 years is 30mg twice a day and for children 6 months to 2 years old is 15 mg once a day. Children suffering from renal impairment are also administered same dosage for both Rhinitis and Urticaria cases. Before using oral suspension, shake the bottle every time and take a precise dosage by measuring with marked measuring spoon or medicine cup. Allegra is to be taken on empty stomach, 1 hour before a meal or 2 hours after a meal. Keep it away from moisture and heat. Due to the fact that liver only metabolizes small percentage of Allegra, therefore its dosage is the same for patients of liver impairment. After the intake, the plasma concentration of Allegra reaches maximum in two to three hours. The reason to take Allegra with empty stomach is that concentrations of Allegra tend to decrease by 20 to 60 percent if you take if immediately after eating food. Food seems to decrease the absorption of Allegra into the blood stream. This decrease is different for different Allegra preparations and is based on the type of medication i.e. whether they are in the form of tablets or ODT or suspension. Inside the plasma most of the Allegra gets attached to plasma proteins. In fact, almost 60-70% of Allegra is found bound to plasma proteins. Most of the Allegra doesn’t undergo metabolism and is excreted as such. Only 5 percent of Allegra is metabolized by the liver. Rest is excreted through the urine. Allegra safety profile is quite positive as it doesn’t result in any type of cardiovascular or sedative effects even if the dosage is ten times higher than the normal dose. The common symptoms of overdose are given below. Side effects of Allegra are categorized in two categories, depending on their severity and moderation (3). These side effects are as follows. If you experience any of the following side effects stop taking Allegra and seek immediate medical help. Following are common side effects that usually resolve on their own within a few days but if these side effects don’t go away, you should seek medical advice. Allegra is not to be taken with any type of juice e.g. apple, orange or grapefruit (4). They decrease the absorption of drug, resulting a decrease in its plasma concentrations. Any type of antacids that contain aluminum or magnesium should not be used after taking Allegra for at least 15 minutes. They cause the drug absorption to decrease by 50 percent. Other than Allegra, if a person uses drugs like Ketoconazole or erythromycin (5) then they should consult with a doctor because while increasing plasma levels also can add to sleepiness. The brand names for aforementioned medicines are as follows. It is a Hydroxyzine metabolite and also an antagonist of Racemic Selective H1 Receptor. Being a second generation antihistamine, it doesn’t cross the blood brain barrier effectively as the result the effects of central nervous system are usually limited. First generation antihistamines cause feeling of drowsiness and also interfere with memory consolidation. These side effects are minimal with anti-histamines of 2nd and 3rd generation. The chemical composition of Zyrtec can be understood by the systematic IUPAC issued to its clinical name Cetirizine. The IUPAC name is (±)-2[4 – [(4- chlorophenyl) phenylmethyle] -1- piperazinyl] ethoxy] acetic acid. In case of Urticaria it treats both itching and swelling. Histamine acting on H1 receptor causes symptoms of itching and redness. Zyrtec is mainly used for treating Hay fever and other allergies that result in aforementioned symptoms. It acts by blocking these H1 receptors and by providing relief temporarily from these symptoms. Zyrtec is also largely prescribed for the treatment of both acute and chronic Urticaria than any other second generation antihistamine drug. It is more preferable in many countries for treating hives and related skin diseases as it doesn’t affect normal brain functioning. Levocitirizine is the active L- enantiomer of Zyrtec. Levocitirizine is highly effective for the treatment of Human Rhinovirus Infection (HRV) (7). Zyrtec has been deemed effective for the treatment of symptoms related to Kimura’s Disease (8). This condition is particularly seen in young Asian men. It is in the form of tumor like lesions affecting the lymph nodes and soft tissues of head and neck. These lesions result in Pruritis (Itching). A study was conducted in which patients were given 10mg Zyrtec on daily basis. Within two months of study, skin lesions disappeared and blood esophinol count became normal. For adults and children of age 6 years and above, the recommended dose is 5 mg or 10 mg once a day depending on the severity of symptoms. For children 2 to 5 years old, recommended dose is 2.5 mg or 5 mg max once a day. Zyrtec can be taken with or without food. It is preferred to take all forms of Zyrtec with empty stomach because absorbed food affects its absorption rate as peek serum level of Zyrtec is achieved after one hour of administration. Chewable tablet is to be chewed before swallowing. ODT Zyrtec should not be chewed or swallowed immediately instead should let to be dissolved in mouth completely before swallowing. Liquid Zyrtec dose should be taken only after measuring via dose measuring spoon or cup. While taking Zyrtec, a person should avoid activities that require alertness and activity of mind and body. Do not use central nervous system depressants. As it excretes in milk it is not recommended for lactating mothers alongside Zyrtec. Person already suffering from renal or hepatic impairment should use this drug after the consultation of their doctors and it might require dosage readjustments. Category B pregnancy women should avoid using Zyrtec (9). Release of eosinophilic chemotactic factors. The patients of Atopic Dermatitis (inflamed itchy skin) when administered a dosage of 20 mg their expression of VCAM- 1 (Vascular Cell Adhesion Protein 1) was inhibited. Other antihistamines show anticholinergic (Neurotransmitter Acetylcholine blocker) properties whereas Zyrtec doesn’t. Pharmacokinetics of Zyrtec are divided into four following steps. After intake Zyrtec remains in the blood stream for about 21 hours before it gets excreted from the body. Zyrtec is to be taken with empty stomach because in blood stream until its excretion its concentration decreases from 20 to 60 percent. The decrease in concentration also depends on the type of medication. As far as the distribution of Zyrtec is concerned, most of it remains bound to plasma proteins. The percentage of plasma protein bound drug concentration is almost 93 percent. Zyrtec undergoes minimal first pass metabolism - the type of metabolism that takes place inside the liver. This limited metabolism occurs via O- Dealkkylation. It results in a metabolite that causes antihistaminic activities. The mean half life of Zyrtec is about 8.3 hours i.e. the drug reaches half of its initial concentration in 8.3 hours. 70 percent of it is excreted primarily through urine in an unchanged form and 10 percent is excreted through feces. Nervous system; it includes headaches, insomnia, and somnolence. Gastrointestinal; it includes vomiting, Pharyngitis, dyspepsia and increased appetite. Hepatic; it includes rare liver abnormalities and sometimes cases of acute Hepatitis. Respiratory; it includes Bronchitis, Sinusitis and Asthma. Psychiatric; it includes delusions and depression in women. Dermatologic; it includes cases of Maculopapular and Urticarial eruptions. While taking Zyrtec person should limit or avoid the use of alcohol. Zyrtec interacts with alcohol resulting in nervous system side effects. Before using Zyrtec, consult with your doctor about all the vitamins or herbs that you are using. Zyrtec interacts with Hepatic or Renal system and may even cause their impairment. Therefore, patients with hepatic and renal impairments should use this drug only after consulting with their health care provider. A total of 640 drugs are known to cause interactions of varying degree with Zyrtec that decrease its efficiency and increase risk of side effects. Among these 640 drugs, 634 interact with Zyrtec in a moderate fashion and remaining 6 interactions are minor. Moderate drugs are clinically significant and should be avoided however can be use under special circumstances. Minor drug interactions are not much clinically significant however do observe caution while using such drugs. Claritin is the trade name for Loratadine, a H1 Histamine Antagonist (Antihistamine) pharmaceutical drug. This drug is used mainly for treating allergies. Structurally it is closely related to the following two drugs. Chemical composition of Claritin can be understood by its systematic IUPAC name given to its clinical name Loratadine. The systemic IUPAC name is Ethyl 4-(8-chloro-5, 6-dihydro-11H- benzo [5, 6] cyclohepata [1, 2-b] pyridine- 11-ylidene)-1- piperidinecarboxylate. Like all other antihistamine drugs it’s for the relief of symptoms rather than treatment. The medical applications of Loratadine are as follows (10). It is also known to treat mild and moderate headaches. Claritin also can reduce the effects of itching in case of Kimura’s Disease. Claritin has been deemed safe for treating allergies and other symptoms for both children and adults. Claritin is available in three forms. The dosage recommendations of all forms of Claritin are as follows. Claritin tablets are recommended to children only above age 12 years and adults of all ages. A 10 mg tablet is to be taken once a day with a full glass of water on an empty stomach. Claritin ODT is recommended for children of age between 6 to 12 years and adults of all age. Children of age between 6 to 12 years are to be given a 5mg tablet once a day whereas children above 12 years and adults are recommended to take a dose of 2 tablets a day. The tablets are to let dissolve on an empty stomach and not to be swallowed as a whole. Children of 2 to 6 years; half teaspoon or 2.5 mg.
Children of 6 to 12 years; 1 teaspoon or 5 mg.
Children above 12 years and adults; 2 teaspoon or 10 mg a day. All types of Claritin can be administered with or without food but preferably without food because absorbed food reduces its absorption rate. ODT Claritin should be left to dissolve in mouth instead of chewing or swallowing as a whole. After dissolving you can swallow it with water. Liquid Claritin is always to be used after shaking the bottle and after measuring with a dose measuring spoon or cup. Claritin or clinically Loratadine is Tricyclic antihistamine of a third generation that blocks the activity of H1 receptors caused by Histamines. Blocking these receptors result in prevention of allergic symptoms. Its sedative effects are limited because of its limited Blood Brain Barrier (BBB) passage. The pharmacokinetics of Claritin is categorized in the following four steps. Claritin is administered orally and its peek effect occurs after 1 to 2 hours of its intake. It is well absorbed from Gastrointestinal Tract. Distribution of Claritin is mostly bound to plasma proteins. This percentage of distribution is in between 97 to 99 percent. Desloratadine is a metabolite of Claritin, which is responsible for Claritin’s antihistaminergic effect. It binds with plasma protein in a percentage of 73 to 76 percent. Unlike the previously two described antihistamines, Claritin undergoes metabolism inside the liver. Therefore, it has a significant first pass effect. Isoenzymes of Chytochrome P450 are responsible for most of its metabolism. The mean biological half life of Claritin is 8 hours i.e. its concentration inside the plasma reduces to half after 8 hours. 40 percent of it is excreted in urine in form of conjugated metabolites and similar amount is excreted out of the body via feces. Claritin side effects are categorized on basis of their severity and moderation. Nervous System; it doesn’t causes significant side effects related to the nervous system. Commonly, it causes only drowsiness and nervousness. Cardiovascular; The cardiovascular side effects of Claritin include side effects like Hypertension, Hypotension, Palpitation, Syncope and Tachycardia. Gastrointestinal; these side effects include nausea and dryness of mouth. Hepatic; it includes Jaundice, Hepatitis and Hepatic Necrosis. Dermatologic; some studies have found that Claritin might be responsible for some dermatological side effects like skin eruptions. Currently Claritin is known to cause interaction with 62 drugs that result in its decreased efficiency. 48 of these drugs are moderately interacted and 14 are minor. Don’t take these interactions lightly and always consult your health care provider before using any combination that is known to develop adverse interactions with Claritin. Mainly liver metabolizes Claritin and the drug and its metabolites are excreted both through urine and feces. That is why patients of Renal or Hepatic or both impairments are at increased risk of side effects (12). Therefore, if you’re suffering from any problem of liver or kidneys then you better consult your health care provider before you start taking Claritin. Another study on 300 patients was conducted to compare the efficacy of Zyrtec (Cetirizine) VS Claritin (Loratadine) VS Allegra (Fexofenadine). There were equal number of males and females and efficacy was based on by looking at Major System Complex (MSC) and Total Symptoms Complex (TSC). Zyrtec showed considerable reduction in MSC as compared to both Allegra and Claritin in the early 24 hours. Zyrtec’s TSC scores were also significant as compared to Allegra and Loratadine. Zyrtec has been deemed effective in the above mentioned and many more clinical trials. 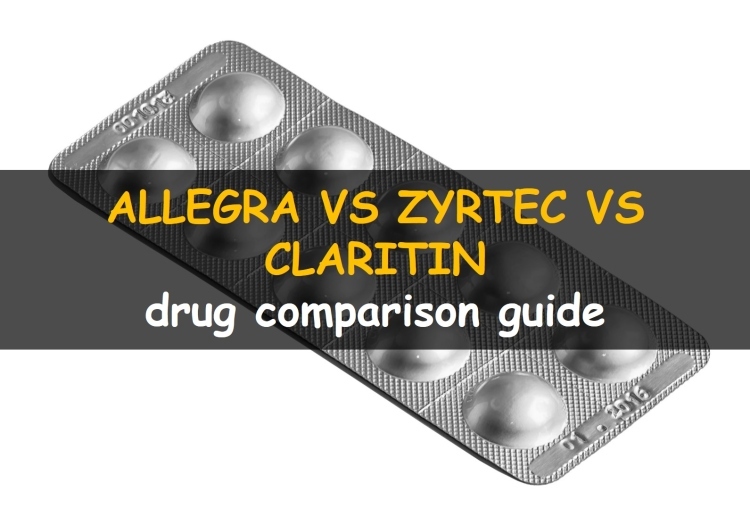 Zyrtec’s efficacy as compared to other antihistamine drugs, Allegra and Claritin seems to be superior. One dose of Zyrtec daily results in quick onset of action than Allegra and Claritin. On the other hand Zyrtec has quite a lot of interactions (a lot more than the other two drugs) and side effects and while it seems to provide better and faster results than the other two drugs, interactions should be watched. As far as its cost is concerned, its price tag is similar to Allegra or Claritin. The final decision about medication to take always belongs to your physician and patients should never take any medicine without prior consent of their doctors. Make sure you get a proper medical advice if you suffer from any condition, including allergies. Even when purchasing over the counter medication you should always ask your pharmacists about its possible benefits and side effects, tell them about other drugs you take and not to exceed recommended daily dosing. De Vos et al. Non-interventional study comparing treatment satisfaction in patients treated with antihistamines. Clinical Drug Investigation 2008; 28(4): 221-230. Comparative outdoor study of the efficacy, onset, duration of action, and safety of cetirizine, loratadine, and fexofenadine for seasonal allergic rhinitis. Additional numbered references are shown with the article.